You all know I like instant gratification projects, but I do work on longer term projects that I don’t share. And then, unshared and in limbo, they languish in my WIP pile. Or worse, I realize a project will take me a long time and don’t even start it! No more. With WIP Words, I’ll be popping in to write posts about longer term projects I have in the pipeline. Many sewing bloggers already do this without the catchy headline, but…hey. I like catchy headlines. It’s what I do! Anyway, hopefully this series will both be helpful to you — giving you all the nitty gritty regarding a pattern, etc — and helpful to me — making my little baby steps visible enough to keep me going. New England is enjoying another mild fall, but winter always comes and coats of all weights and compositions are necessary for this time of year. I’ve long feared coat making, for all the parts and notions and time they require, but I’ve rarely been happy with my RTW coats. Enter Lekala 4383. It’s not an easy or simple pattern, but I liked it. I liked the design lines, the giant buttons, the pockets. I bought it. $3.14 including seam allowances, and drafted to my personal measurements. Starting off on the right foot, right? (1) This coat has a center back seam not indicated on the technical drawing. (2) The cool diagonal design lines on the upper side fronts don’t actually exist in the finished coat. (3) I don’t understand why both sides of the front need a placket. I began to read the directions. They were okay if you know basic garment construction. 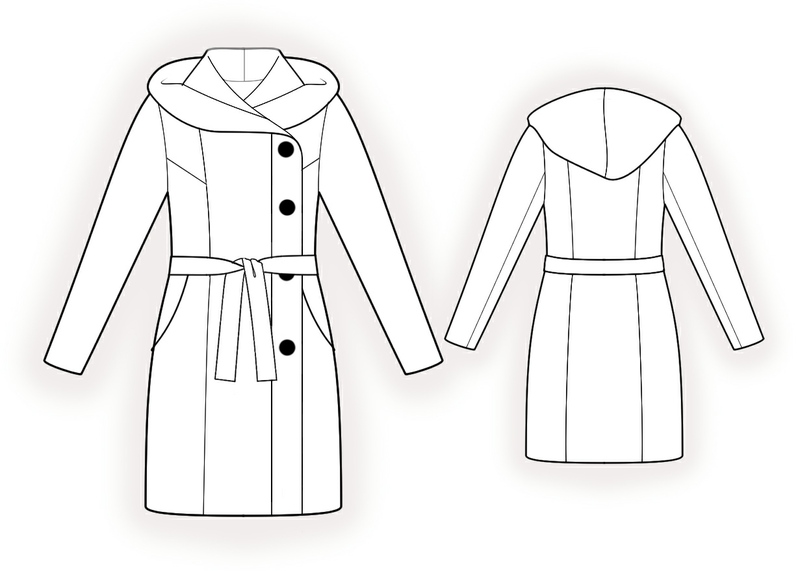 From a sewing perspective, this coat is pretty straightforward. From a translation/language perspective…well, for a $3 custom pattern I ain’t complaining. I did enjoy the use of the word ‘pairwise’. Is that a word? I stopped reading when the instructions got to the lining because they began to be overwhelming. Cross that bridge when I get to it. I love having Porky. I cut everything and pinned the pieces to her as best I could, to get a sense of the size and design lines. I will deepen the pockets by an inch because I have large hands and like to jam them fully in my pockets, but I suspect the extra space isn’t really necessary. I’m going to muslin the hood and the sleeves to see how they fit my large head and large biceps, respectively. My goodness, it sounds like I’m making a coat for King Kong! For materials, I — as usual — complicated things. I’m using a knit fabric I bought in Montreal last year, some insulating interlining I bought at a local fabric store (Sew Low, now closed), some cotton jersey or cotton flannel for a lining, and some faux fur I bought at a different local fabric store (Winmil) for a contrast lining. I also got buttons and snaps from Winmil. I don’t do buttonholes, my friends!!! Well that’s disappointing! I would contact Lekala and let them know – maybe they need to tweak the draft, or update the line drawing to match the pattern. Good point, Anne! I often forget that most companies want to provide accurate information — letting them know about things like this could actually be helpful to them. Hi Ebi: What brand is your dress form? I am in the market for one and can’t decided what to buy. Hi Shirley! It’s a Dritz dressform — I’ll email you the link tonight. It’s fairly cheap, and awkward to pin, but for a first dressform it does the trick. I can’t wait to see the finished work. That fabric is really cool and the idea of an actual coat (not jacket) in a knit sounds fun! HAHA!! Offended! I was confused! You would have laughed at the amount of time I spent trying to reconcile the pattern pieces and the drawing. Lekala….dressforms are a godsend. Did your mom end up using hers? Seriously, they save so much time and headache figuring things out and checking fit, etc. She did!! And last night was down to just getting the sleeves in. Yay! Also, I love your paper hood. Lololol!!!! !